With increasing automation in vehicles ranging from Advanced Driver Assistance Systems (ADAS) to Autonomous cars, the response/behavior of the driver in addition to these systems also changes. HAN-AR now offers research facilities that exclusively focuses on Driver Behavior. 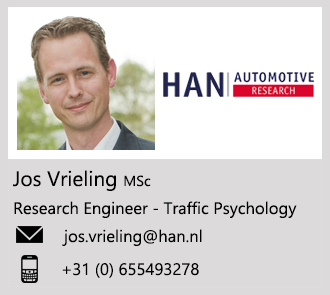 In traffic psychology, there are two main streams of research: monitoring the actual driving behavior and questionnaires. Driving behavior is measured via for instance driven (and differences in) speed, lateral position and steering corrections. But also eye movement, cardiovascular reactivity, galvanic skin response can be measured. On one hand, the data can be gathered from the vehicle or from cameras alongside the road. This leads to objective data which describes driving behavior. On the other hand, it is interesting to ask drivers what their opinion is with respect to the road, safety, other road users or technique of their vehicle: do they use ADAS and what do they think of these systems? It is also possible to compare both objective and subjective data: actual driving behavior can be explained by the opinion of the particular driver. For example, driving through roadworks, if one drives too fast it can be explained by the driver that he or she doesn’t feel the urge to slow down because the road environment looks like a normal road. It is always important to emphasize that there’s not one driver, but different groups of drivers. For instance, truck drivers have another view of the road and are especially dependent on their mirrors. Another important group is that of the bicyclists or elderly drivers: their information processing is slower and if an incident occurs they are more likely to be injured, thus, making driver behavior an extremely important subject to investigate. Modern vehicles are equipped with ADAS to help drivers to perform their driving task and improve traffic safety. The Society of Automotive Engineers (SAE) introduced five levels of automation in 2014 varying from ZERO to FULL automation. Momentarily vehicles are equipped with level 1 (cruise control, lane departure warning (LDW) and blind spot monitoring (BSM)) or level 2 (adaptive cruise control (ACC), lane keeping assist (LKA) and the autopilot function of Tesla) driver-assistance systems. ADAS can help drivers to perform their driving task but the higher SAE level, more the driver has to monitor the vehicle: is the vehicle driving the right speed or making proper steering corrections? If the vehicle behaves reliably it’s harder for the driver to monitor this task because people are bad monitors. The risk that people will get bored by this monitoring task and become distracted by smartphones, other in-vehicle applications or by the road environment could be high. If an incident occurs and action of the driver is required, it can last for more than five seconds to take over control. Normally the driver could react in a split second. This is called the transition of control and it is an important subject that has to be studied. Imagine yourself driving in a level 4 or 5 vehicles: you don’t need to use the steering wheel, throttle and brake anymore. The driver now turns into a passenger. You’ll be able to empty your mailbox, look at videos and chill. You don’t need to look around. Compare this to a driver in a vehicle without driver-assistance, he or she has to be focused all the time: keep the right speed, make steering corrections, brake when necessary, etc. It’s important to look at the road (environment). The higher the SAE-level the more drivers are prone to motion or car sickness. The best way to avoid car sickness is to look ahead and focus on the horizon: the driver turns into a passenger. HAN developed DASS: driver adaptive support system in order to improve driver and traffic safety and to make the best fit between auto technique and driver behavior. This is a follow-up of the ADVICE research.